Having been sold into slavery by his jealous brothers, Joseph is sitting in prison in Egypt because of false charges leveled at him by his former master’s wife. Now the Pharaoh has had a very disturbing dream that no one can interpret. Pharaoh’s butler tells him about Joseph who correctly interpreted a dream for him when he was in prison two years previously. Pharaoh calls for Joseph to interpret his dream. As we read the interpretation it seems self evident, doesn’t it? Of course the seven cows represent seven years etc. But remember: it now seems self evident because we know the rest of the story and because it was actually God who gave the interpretation to Joseph. Others tried and were unable to interpret the dream for Pharaoh. 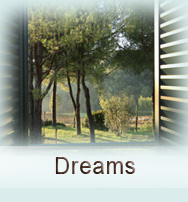 Our lesson is to take our dreams to God and ask him to interpret them rather than endlessly speculate. Also notice how God repeated the dream to Pharaoh to emphasize that it was a coming event set in stone – not something that could be averted. After Joseph was given the meaning of the dream he was also given the solution: Pharaoh was advised to store up supplies during the time of plenty to be used later during the seven years of famine. This wisdom earned Joseph the position of authority in Egypt comparable to Prime Minister or Secretary of State in today’s government. So, in addition to understanding our dreams, we should pray for the wisdom to apply them correctly in a way that brings blessings to those affected by the prophetic dream.